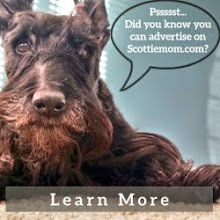 Scottie Mom: Love you like a Scottie! Every day, I get to share the lives of Heather and Mr. K. And every day, I am inspired by the community of Scottie lovers that has formed around our little family. This Valentine's Day, I wanted to give back by sharing the spotlight with these incredible Scottie Love stories submitted by Scottie Moms and Dads just like you! Remember: as you celebrate your loved ones, make sure you tell them LYLAS (love you like a Scottie)...because there is no love greater than Scottie Love! Sometimes it takes a heartbreak to find true love. 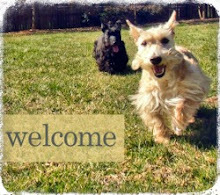 Our Scottie Collin (pictured above to the left) came to our home from Scottie Kingdom Rescue in Dallas, Texas. Collin had health issues but in the three years he lived with us, he experienced love, a safe home and lots of squirrels in the backyard. One day, Collin stopped eating. He wouldn't even take a snack or cheese and we knew something was wrong. A visit to the vet confirmed our worse fears. Organ failure and a multitude of other issues required the inevitable decision. It was one of the most difficult days that anyone could experience. The following week, we decided to take a drive in the country. My other half was looking at his phone. I asked him what he was doing. He sheepishly said, "nothing." I grabbed his phone and a little wheaten Scottie face was on the screen. His name is Jameson. Jameson's family worked long hours and weren't able to give him the time and dedication he needed. The pain of losing Collin was still so fresh in my mind that it was difficult to comprehend the emotional investment of bringing in a new Scottie member of the family. That being said, the more I looked at the sweet little face, the more I fell in love. Two weeks later, we met the family in West Texas and brought Jameson home. Jameson (pictured above to the right) had a special way and gentle spirit about him. He seemed to sense the recent void in our lives and did everything he could to fill the space. Jameson has brought laughter and joy to our home. We love him and he loves us. Scotties are special that way. Sometimes it takes a Scottie to teach us about unconditional love. Susie, costar of the Susie and Sidebite blog, found herself in a puppy mill and was fortunate to be rescued by her forever family at just nine months old. The first eight months or so of her life were extremely difficult, having lived inside a cage for the majority of that time. When Susie was purchased from the puppy mill by her first owners, it wasn't long before she was dumped at a pound because she was not "sociable" enough for them. The day Susie was scheduled to be put down at the pound, a rescue group discovered her and just a short time later, Susie's future Scottie Mom and Dad inquired about her and asked to take her home. 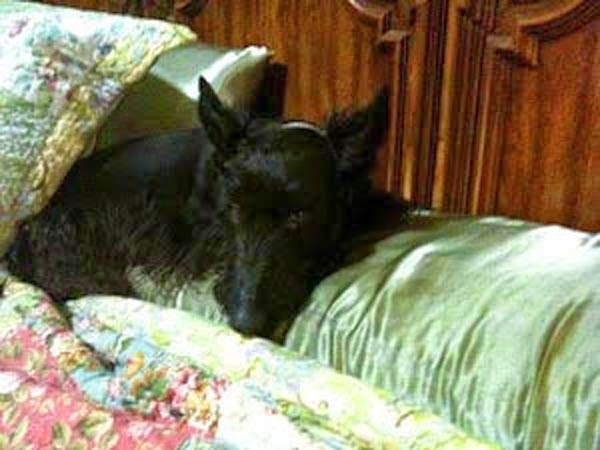 Today, Susie is the queen of her Scottie House and enjoys life with her brother Sidebite and big sister Shadow. Susie's Scottie Mom describes the moral of the story best with these simple words she spoke to Susie when they first met: “You may be a mess, but love will fix you up!" To keep up with the adventures of Susie and Sidebite, be sure to check out their blog here. As you can see, Pierson from American Dog Blog is no Scottie but you bet he has a love story that will fill your heart with the good stuff! 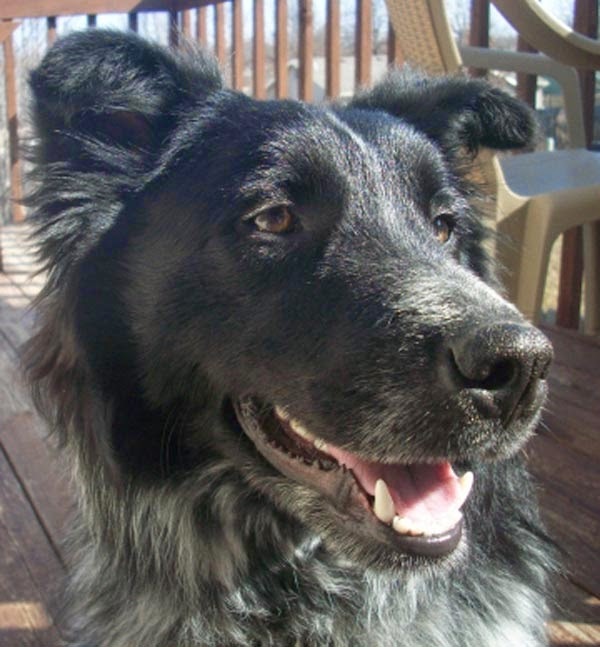 He lived as a stray in Pierson Park, Kansas City before his Border Collie Mix Mom found him. She came back to the park three days in a row to try to convince sweet Pierson to come home with her. Finally, on the third day, an older gentleman came and told her he had been feeding Pierson for about three weeks. Together Pierson's Mom and the older man coaxed Pierson to get closer to the car where the older man scooped Pierson up in his arms and sent him on the ride of his life...to his forever home! To read Pierson's full gotcha story, click here. Such lovely stories with happy endings. I have loved Scotties from the age of 5 years when my dad came home with a little black Scottie he had bought from a man in a market. We called him Jock, jockey boy. We absolutely adored him and all my life I have always had a scottiiedog by my side. I am now 75 next month and have Jamie now. Yes, unconditional love. I have had 10 of these little treasures to love. How lucky is that.? Shelagh from the UK. Sweet stories - thanks for sharing. Dogs are miracle healers aren't they. Thank you so much for sharing Pierson's story!!! ♥ ♥ ♥ I loved those other rescue stories too. It feels so good to do something for someone (or somedog) else. And they are so grateful. I'm going to go check out Susie's blog. Pierson had his issues when I got him, and in some ways still does. But love has helped him come a long way and I bet it is the same with Susie. We agree wonderful tails and bitter sweet. Have a marvellous Monday. WOW, how did I miss this post with ME in it. Thanks so much! What a bunch of beautiful pups! I always love a doggy love-story! Wonderful stories. We know Susie and how she came to her family. This is such an awesome idea to share the love stories of other scotties and honorary scotties!